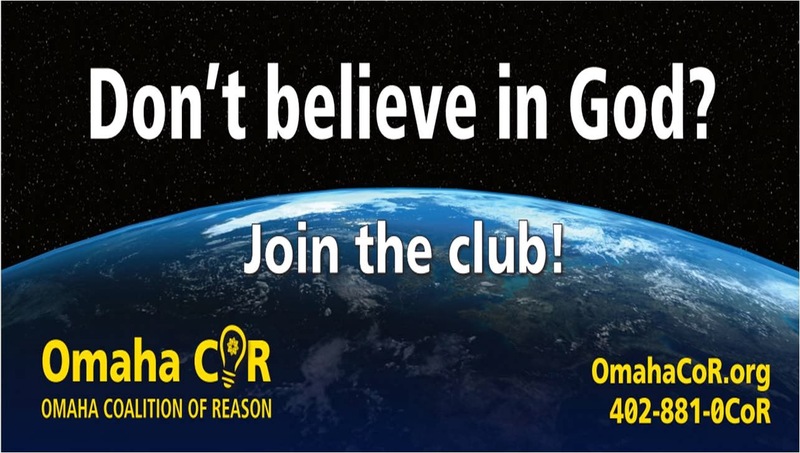 Of all the messages I've seen on atheist billboards, this has always been one of my favorites. It is brief, simple, and tells atheists that there are others like them. Oh, and it also offends Christians in every location where it has gone up. Since there is absolutely nothing even remotely offensive about this billboard, the inevitable conclusion is that many Christians are offended by the fact that there are atheists. If that isn't bigotry and hatred, I'm not sure what would be. Hemant Mehta (Friendly Atheist) brings us news of this particular billboard being erected in Omaha. As he notes, the local TV news did not have much trouble finding Christians offended by this billboard. KMTV News quoted Emlyn Forsuh as saying, "I was raised to believe in god and now someone says they don't believe in god so I don't like it." Too damn bad. Apparently, it never occurred to Christians like Emlyn that this billboard might not be for them. When I read stories like this, I cannot help concluding that some Christians are simply offended by the very existence of atheists. They are going to have to get used to feeling offended though. We're not going anywhere, our numbers are on the rise, and many of us are tired of keeping our thoughts to ourselves. The more of these billboards that go up around the U.S., the better. The more the local news highlights Christian offended by such thoroughly inoffensive messages, the better. When Christian bigotry is exposed, the eventual result will be fewer Christians.